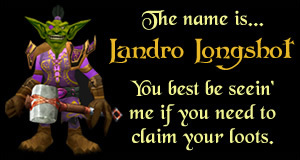 Q: Where can I get my hands on some of the awesome WoW Loot featured on this site? A: All of the WoW TCG loot featured on this site is purchasable through ebay . Just click on the item to make a purchase, or to place your bid. Q: Some of this WoW loot is really expensive; especially the mounts... wouldn't it be better to just buy a box of booster packs and get it that way? Q: I have a gambling spirit... how many loot cards could I expect to pull from a box if I were to try my luck? A: There's no definite answer, but you could expect an Expansion Set box to likely contain 2-3 loot cards. Q: I've found what looks to be a WoW TCG loot card, but I'm not sure... how can I tell if it is an actual loot card? A: Look on the back of the card. If there is a metallic strip, similar to that found on a lottery ticket, you've just found a WoW TCG loot card! Now just scratch off the metallic strip to reveal the code. Q: Where do I go to redeem my WoW TCG loot codes? A: Go to the Promotion Code Retrieval Page at the offical World of Warcraft site. Here you will enter the WoW TCG loot card code, then be given an in-game loot code in exchange. Be sure to record this number. Q: I've redeemed the loot card code at the World of Warcraft website, now what..? A: Trek on over to Booty Bay and visit Landro Longshot. Give him your in-game loot code and he'll hand you over some precious WoW loot. Q: Do the WoW loot items apply to all of my characters? A: The mounts and the pets are bind on account, but misc loot items like: costumes, disguises, hearthstone replacements, etc...are not. Be sure to visit Landro Longshot with your intended character if the item is bind on pickup. Q: Can I sell the WoW TCG loot on the auction house or sell it to a player for in-game gold if I decide I don't want it? A: Yes and NO. Some of the items are bind on pickup, which means they are bound to you once you redeem the loot code(s). However, much of the newer loot is bind on equip. The BoE loot you can sell on the auction house or to another player. Q: If I don't redeem my WoW TCG loot code right away, do I ever have to worry about it expiring? A: No. Currently there are no expiration dates for any of the WoW TCG loot card codes. Q: I have a bunch of WoW TCG cards redeemable for UDE Points. What can I do with these? A: Unfortunately nothing. Upper Deck is no longer producing the WoW TCG, therefore they've closed their UDE Points program.